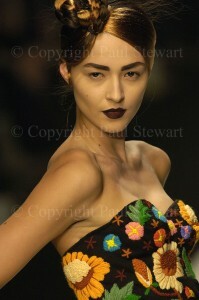 Shooting catwalk fashion should be like shooting fish in a barrel, It should be impossible to miss. Lets face it you are presented with handsome men and beautiful women, walking toward you, wanting to have their pictures taken. So why do so many people get it so badly wrong. Like all good photography, the answer is timing. If you are at an event like one of the various “Fashion Weeks” that occur all round the world, then you will almost certainly be in a pen at the end of the runway with a myriad of other photographers, all vying for the best image. The most important thing is to get eye contact if at all possible. This lifts the image and gives it life. Fashion can be rewarding to shoot, but it is important to try and get a good position and to work out which way the models are going to walk on the catwalk. It can all be, like Formula 1 motor racing, bit of a circus. In the past I have covered these f shion shows in London, New York, Milan and Paris and they do tend to become very formulaic, but they can make impressive pictures that look good in papers and magazines. Magazine, catalogue and advertising fashion on the other hand is a different matter. Wheter it’s shoton location or in a studio, this is something where the photographer can be creative, infact some of the images produced can be like fine art. I’ve always enjoyed the challenges of all aspects of fashion photography, except perhaps for dealing with some with some of the so called “Super Models” personalities.